The news of a 'wireless' speaker system will sound like a dream come true to anyone wanting to reduce the amount of cables trailing around their living room. In reality, the system partnered with the superb looking Crystal Audio THX-3D12 surround sound speaker package isn't quite as free of wires as you might think. Each dipole rear speaker connects to a 150W monobloc amplifier/receiver and the stereo transmitter connects to a surround amp using the rear speaker outputs or pre-outputs. It's a fiddly process that requires four short cable runs and additional plug sockets to power the transmitter and both receivers. Nevertheless, it's a high-quality wireless 2.4GHz solution sending 16-bit, 48kHz uncompressed digital audio. It claims an interference-free signal regardless of other wireless networks, appliances or human movement, but there are eight channel selectors in case you experience any problems. The speaker's THX Select certification means that the package meets with approved home cinema performance criteria. Fibre-weave mid/bass drivers are used throughout the system, offering extraordinarily rigid properties for a fast response time ideally suited to 5.1-channel soundtrack characteristics. Unusually, the tweeter is perched on top of the front stereo and centre speaker cabinets. Its 'free air' design claims crystal clear sound, and it can swivel horizontally to align with your listening position for perfect stereo imaging. The dipole rear speakers have the tweeters mounted within the cabinets either side of the centrally positioned mid/bass driver. They utilise the same drivers as the front speakers for seamless sonic surround characteristics, yet offer a more natural sound dispersion and effects placement than omni-directional rear speaker models. The subwoofer is large for most domestic situations, but looks like it delivers plenty of punch from its capacious cabinet and 30.5cm bass driver driven by a 200W built-in amplifier. The first thing that hits you when listening to the speaker package is the amazing soundstage it presents with movie soundtracks. Surround effects placement during the initial sequences of Apocalypto on DVD is impressive, conjuring up one of the most natural surround sound experiences we have heard. The monster-sized sub delivers firm bass levels, but it's not quite as deep as we expect given its size, and the level control needs to be set fairly high for the best integration. The Crystal Audio is better suited to 5.1 movies than stereo music listening, but this is no big criticism. 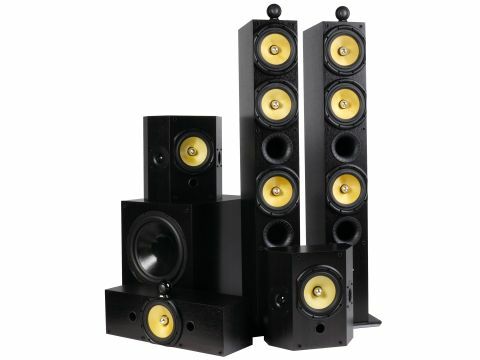 If you're in the market for a compelling surround speaker package and like the idea of reducing lengthy cable runs to the back of the room then you'll be hard pressed to find a more involving home cinema package for less.